2.1 Where is the JDT/Core code? 2.2 How do I create a Git repository connection? 2.5 How should I format my code? 3 What should I do before committing a fix? 3.4 What if another committer makes changes in my code? 3.5 What should I do to backport a fix? 4.1 How do I maintain the build notes? 4.2 What comment should I associate with a commit? 4.5 How do I warn users after I changed the build state version or the index file version? 4.6 What are the rules to release code in the maintenance branch? 5.1 What is the JDT/Core bugs life cycle? 5.2 What bugs are currently opened against JDT/Core? 5.5 The resolution LATER is deprecated. What should I use instead? 5.6 The resolution REMIND is deprecated. What should I use instead? 5.7 What status/resolution should I use after marking a bug duplicate? 5.8 When can I set a bug to VERIFIED? 6.1 What steps should I follow to make a build contribution? 6.2 What is the milestone verification process? 6.2.1 What is the bugs verification phase? 6.2.1.1 What are the bugs I have to verify? 6.2.1.2 When do I have to verify my bugs? 6.2.1.3 How do I verify my bugs? 6.2.1.4 What if I my fix is not in the build used for the verification? 6.2.1.5 When can I consider the verification finished? 6.2.1.6 What should I do if I need to contribute after the verification was finished? 6.2.2 What is the build test usage? 6.3 How do I deliver a patch for a maintenance stream? 7.1 How do I get the JDT/Core tools? This FAQ is for the JDT/Core committers, and anyone who is willing to participate in the development of JDT/Core. This FAQ is about the rules that JDT/Core committers follow when developing the JDT/Core component. You should send a message to jdt-core-dev@eclipse.org with the diff url (e.g. http://wiki.eclipse.org/index.php?title=JDT_Core_Committer_FAQ&diff=50788&oldid=50780) so that every JDT/Core committer is aware of the change. For the occasional contributor the easiest way to get started is the JDT Code Setup Using Oomph. Use either the Eclipse IDE for Eclipse Committers or Eclipse for RCP and RAP Developers. Where is the JDT/Core code? How do I create a Git repository connection? Go through http://wiki.eclipse.org/Platform-releng/Git_Workflows to see how to set up Egit and create repository connections. If you're not a committer you should use http instead of ssh, with user id as 'anonymous' and password left blank. master: used for the development of the upcoming release. For example, master is currently used for the development of 4.5. R4_x_maintenance: used for the maintenance of a release. For example, R4_4_maintenance is currently used for the development of 4.4.1. JDT/Core uses project-specific settings for compiler warnings/errors, code formatting etc, which you will automatically get when you clone the Git repository. So you do not have to worry about configuring these. Get a 1.8 JDK and set it up in the "Installed JREs" section in the Eclipse preferences under "Java". You will need this for JDT/Core and tests. You cannot use language features or APIs of Java versions greater than 1.8 while writing your code. For development in the master branch, the target platform should be the latest 4.6 I-build. By default, the Eclipse SDK will use the Running Platform as the target platform. However you may want to use a different Eclipse version for development, e.g. an older stable version of Eclipse. In such a case you should still download the latest 4.6 I-build and use that as the target platform. Enable API tooling, and specify an appropriate API baseline. For example, for 4.5 development the baseline should be 4.4.2 or 4.4.1 or 4.4 in that order depending on availability of the release. Read Ayushman's blogpost here for more on this. Don't add comments that just describe what the code does. If the code is not clear enough, refactor it (rename, extract method, ...). Only add comments that explain non-obvious algorithms or data structures. Only add a reference to a bug if it contains a lot of discussions that lead to the current solution, or if the code is a workaround for an open bug. Show Annotations (git blame) is usually good enough to reveal the history. References to JLS sections are actually very useful when trying to understand the relation of our implementation to the specification. Testing is imperative to the health of the project. We have a significant amount of tests. The quantity of tests will keep growing as more functionality is added to JDT Core. If you are contributing a fix or writing an enhancement, it is a requirement that tests are written. If you don't write them a committer will have to and that could slow down the contribution process. Most tests are included in org.eclipse.jdt.core.tests. * projects. If you create a new TestCase make sure to add it to the correct test suite. To launch an existing test, open it in the editor, click on "Run Configurations..." in the coolbar, and create a new "JUnit Plug-in Test". Go to the "Main" tab and choose "Run an application" and select "[No Application - Headless Mode]". Also select the runtime JRE as the latest and greatest version of java that JDT supports. Currently, it is the JavaSE 8. Make sure you have a 1.8 JDK with you. To launch all the JDT/Core tests at once, org.eclipse.jdt.core.tests.RunJDTCoreTests should be run. If you want to make a good impression, write tests. This goes for any project, of course. Since all Eclipse SDK projects are configured also for building with Maven/Tycho, you can alternatively build and test JDT/Core on the command line. This is actually part of what the full SDK build is doing, see Platform-releng/Platform_Build. Before doing so, you have to tell Maven, where to find the required JREs. This is done using a toolchains.xml file in your user's .m2 directory. See Platform-releng/toolchainsExample for an example. Unfortunately, just for all JDT/Core bundles you'll need versions 1.4, 1.5, 1.6 and 1.8 installed locally. At least we don't use any versions below 1.4, so you don't need to install the execution environment descriptions mentioned elsewhere. Caveat: inside the toolchain file, it says you're specifying a path to a JDK, which appears to be imprecise: you need to point to a JRE, so if you have a JDK installed in /your/path/jdk1.8 the toolchain must point to /your/path/jdk1.8/jre! According to bug 514471#c57 this should no longer be an issue in tycho 1.1.0 and newer. Also note, that apparently you need to define JAVA_HOME to point to your JDK 1.8 install. In this command line only the two profiles build-individual-bundles and bree-libs are Eclipse specific, the rest is standard Maven. In theory, you should be able to build/test individual modules, but when trying this I couldn't convince tycho to find the results of its own previous module builds (using install). What should I do before committing a fix? Make sure the code is free of errors and also does not introduce any additional warnings. Make sure all tests are green. You can choose to run the tests manually or request Hudson to do that for you. Each fix should have one or more corresponding regression test(s) (except fixes for race conditions, fixes for problems that cannot be reproduced and doc fixes). When ready, prepare to commit to git (Do not 'push' yet). If you're a committer and you want to release your code without a review, you can continue reading these steps , otherwise jump to #Releasing to gerrit code review. Choose Team > Commit... in EGit to open the Commit dialog. In the commit comments, mention the complete bug summary, starting with the bug number. E.g. 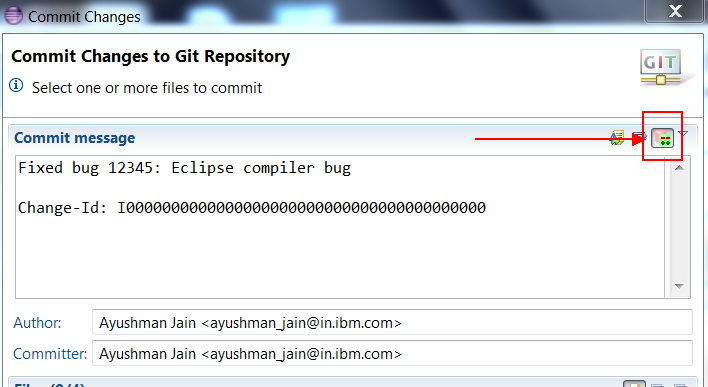 : "Fixed bug 12345: Eclipse compiler bug". Alternatively, a commit can be incrementally crafted using the Git Staging view. Make sure the author and committer fields contain correct credentials. If you're releasing a patch for another person, please add their name and email in the "author" field. Click 'Commit'. Do a 'pull' on the jdt.core git repo so that you have the latest version of the code. Right-click on the jdt.core repo in the "Git Repositories" view and click "Push...". Click next after ensuring that the destination git repo is the correct one (ssh://userid@git.eclipse.org:29418/jdt/eclipse.jdt.core.git). In the ref spec setting, choose the current branch you're working on as "source" and in the "destination", type refs/heads/master (or refs/heads/R4_x_maintenance or refs/for/userid/topicBranch according to where you want to push). Now 'push'. In newer versions of EGit and if you are working on master you can simply say Push to Upstream. Add a comment in the Bugzilla bug that includes a link to the commit (http://git.eclipse.org/c/jdt/eclipse.jdt.core.git/commit/?id=<commitId>). 2. If you're not a committer, select the 'Add Signed-off-by' button to add a 'Signed-off-by: Your Name <email@example.com>' line after the change-id. 3. Make sure the author and committer fields contain correct credentials. If you're releasing a patch for another person, please add their name and email in the "author" field. Click 'Commit'. 4. Do a 'pull' on the jdt.core git repo so that you have the latest version of the code. 5. Right-click on the jdt.core repo in the "Git repositories" perspective and click "Push to Gerrit...". Ensure that the destination git repo is the correct one (ssh://userid@git.eclipse.org:29418/jdt/eclipse.jdt.core.git). Set the Gerrit branch to refs/for/master (or refs/for/R3_x_maintenance or refs/for/userid/topicBranch according to where you want to push). Now click 'Finish'. The result will show a new branch getting created, but in fact the actual result is the patch is pushed to Gerrit! 6. Go to the URL https://git.eclipse.org/r/#/. Here you will see the new changes you just pushed. Click on them and mark someone for review. The copyright header goes before the package declaration, starting in the very first line. If you're a committer releasing a contributor's patch, make sure that the contributor's name and email address is set in the "author" field. The contributed patch will have both author and committer fields set to the credentials of the contributor. You need to change the 'committer' field to reflect your credentials. To do so, please fetch the patch into Eclipse from gerrit (see the section "Fetching a patch from gerrit"). Without changing anything, choose "Team>Commit.." and then click the "Amend commit" button on top right corner of the commit dialog. Now change the 'committer' field to fill in your name and email id "registered with Gerrit" (imp. otherwise push will fail). Now make sure the change-id is part of the commit message and click commit. (Optional, but recommended to keep the repo history clean) Rebase on top of origin/master if the change in targetted for master. In case the rebase fails, ask the contributor to do it, no need to waste your time solving conflicts. Push to refs/for/<destination branch> as instructed in step 4 of "Releasing to gerrit code review" above. Go to the gerrit link, and mark the patch as +2 for review, and +1 each for verified and ip clean. Gerrit auto-releases the patch to git. Close the bugzilla bug. 1. To fetch a patch from gerrit into Eclipse, go to the Gerrit URL where the review is requested. Click the patch set you want to fetch. Copy the ref as shown below. This will be the source branch to fetch from Gerrit. 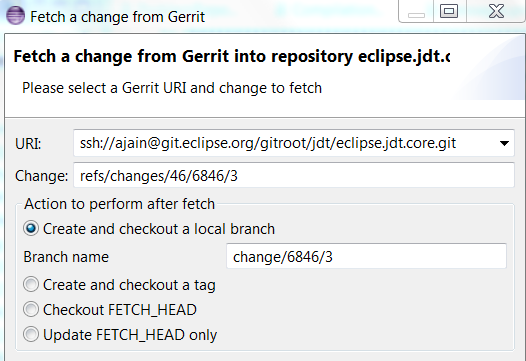 2.Now go to "Git Repositories" perspective in Eclipse and right-click on jdt.core repo and choose "Fetch from Gerrit...". 3.Paste the path copied in step 1 above in the "Change" as shown below. 4. Click Finish and you will have a new branch created with the changes. See EGit/User_Guide#Fetching_a_change_from_a_Gerrit_Code_Review_Server for more info. What if another committer makes changes in my code? Each committer is responsible for checking incoming changes in his/her own code. So if another committer makes changes in your code, you should make sure that the change is correct when pulling from the GIT repository. When a bug is fixed in master, it is sometimes interesting (or necessary) to backport the fix to the maintenance branch. The fix needs first to be modified in order to be applied on top of the maintenance branch's code. It may be easy or tricky depending on how the patch's code area has been touched in the branch. The bug is either in RESOLVED/FIXED or VERIFIED/FIXED state, which means respectively either in State 2 or in State 2.1 according to the JDT/Core bug life cycle. Note that in this case, the bug might need to be reopened if the maintenance stream was frozen owing to a service release end of cycle (see JDT/Core bug life cycle (State 2.2). if the bug is in State 2: "To be verified for <next milestone>" (e.g. To be verified for 3.5M3). How do I maintain the build notes? Starting from 3.9, an automated e-mail is sent to the release engineering group with the list of projects that have changed and bugs that were fixed for the current build. It's been decided not to maintain a separate build notes for the JDT/Core team. However, should there be a need to make special announcement for a particular build, we can do so by keeping a file namely org.eclipse.jdt.core\buildnotes_jdt-core.html and putting the content in it. When doing so, also make sure that the file is either removed or updated for the subsequent build(s). The comment of a commit should be of the form: fixed bug <bug number with summary>, e.g. The milestone stream has to stay clean until the milestone is declared. Then, we would be able to fix a stop shipping bug and contribute again without introducing any other changes since the verification process. However, looking at milestone history, re-contributing seldom happened, so if this is really necessary and only for master branch, code releases are allowed if the verification process has well finished and the stream reopened for development. The development stream also needs to stay clean during the build input process. The build input can start between 1.30 AM EST to 5 AM EST on the day of the build input and it ends when "Released v_XXX for today's build input" message is sent on jdt-core-dev@eclipse.dev mailing list. It is generally advisable to not release anything on the build input day till the build completes.However, if you have an important fix to release and you're not 100% sure that it will be done before the build input starts , then just ask to delay it until you're ready by sending a note to jdt-core-dev. As the process can be shorten a little bit, it is possible to accept safe contribution until one hour before the build input starts... But of course you should not abuse this flexibility. How do I warn users after I changed the build state version or the index file version? Changing the build state version org.eclipse.jdt.internal.core.builder.State#VERSION will cause a full build when the user restarts the workspace with the new version. As well changing the index file version org.eclipse.jdt.internal.core.index.DiskIndex#SIGNATURE will cause all files in the workspace to be reindexed when the user restarts the workspace with the new version. In both case, you should add an entry in the build notes in the "What's new" section so that users are aware of this change. <li>Fix for <a href="http://bugs.eclipse.org/bugs/show_bug.cgi?id=????? ">bug ???? ?</a> required the build state format to change. As a consequence, a full rebuild is expected when reusing existing workspaces. <li>Fix for <a href="http://bugs.eclipse.org/bugs/show_bug.cgi?id=????? ">bug ???? ?</a> required the index version to be incremented. What are the rules to release code in the maintenance branch? You should not start on a fix in maintenance branch (either specific or backport from master) before having got the +1 from the JDT/Core lead added as a comment in the corresponding bug. Then, when the fix is ready, it must be attached to the bug (as usual) and be reviewed by another JDT developer. No code should be released in the maintenance branch without these two conditions verified. Incoming bugs are triaged by a full-time committer on a rotating basis. The goal is to have an empty inbox, no bug should stay in the inbox for longer than a few days. As part of the triage, we need to make sure that the bug contains enough information, and that the "severity" is set to a value that makes sense. Enhancement request need to be marked as such, and the same is true for blocker/critical bugs. The bug also needs to be prefixed with the tag [componentArea]. The QA contact is set to the committer responsible for fixing bugs in the particular area. Note: A bug in the jdt-core-triaged inbox means that it is open to contributions from anyone who wants to take a shot at fixing it. If you want to contribute to such a bug, please leave a comment showing your interest in doing so, or if you're a committer, assign the bug to yourself. Double-check that there is enough information in the bug, and that the severity is accurate. If it is a blocker or critical bug (e.g. loss of data, crash), it needs to be fixed as soon as possible. If you are not able to fix the bug yourself, assign it to someone else who is. If it is a regression, it needs to be fixed during the current development cycle, or potentially in a maintenance stream as well. Schedule the bug accordingly, or assign it to someone else who has time to work on it. For all other bugs, follow any activity closely and when you are ready to start working on it, assign it to yourself. What bugs are currently opened against JDT/Core? Bugs opened and not resolved yet. First, assign it to you, (as we always do). First, assign it to you (this will help bugs dispatching during the verification process - see What are the bugs I have to verify). First, assign it to you. Note that the next milestone or rollup may be different than the target of the original bug. - As soon as you modify the target of a bug, then you have to go through all its duplicates if any and set these duplicates with the same milestone as the one used for the original bug. When changing a bug to RESOLVED/FIXED a comment containing the following string should be use: "released for <target milestone | maintenance release>". E.g. This string is used when querying the bugs to verify for a particular milestone. The resolution LATER is deprecated. What should I use instead? Bugs that we don't plan to fix used to be resolved as LATER. Since this resolution is deprecated, we shall now use the P5 priority. Bugs that needed more information used to be resolved as REMIND. Since this resolution is deprecated, we shall now use the needinfo keyword. What status/resolution should I use after marking a bug duplicate? When can I set a bug to VERIFIED? What steps should I follow to make a build contribution? Ensure that your local clone for org.eclipse.jdt.core repository is in sync with the remote. If you would like to announce something via the build notes, i.e. apart from the bugs that got fixed in this build, you can do so by updating the build notes as mentioned in the build notes section. For the master branch alone, there is a dedicated integration branch. Ensure local master is in sync with the remote repository and does not have any local commits or changes. Checkout integration branch and rebase with master (with integration branch checked out, do a git rebase master ). 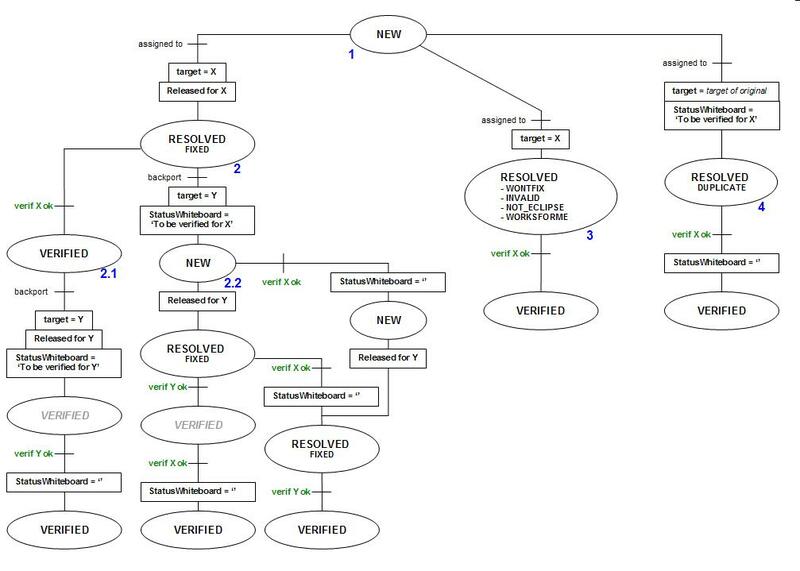 If required, repeat the above steps for the org.eclipse.jdt.core.binariers repository. For a maintenance stream, since we don't have integration branch, there is no build-input involved. Before the build is started, ensure sync up the stream concerned and ensure that all tests pass. It's possible, but it's been decided not, to have a dedicated integration branch for the maintenance streams as well by specifying/updating the corresponding entry in org.eclipse.releng/tagging/repositories.txt file. What is the milestone verification process? What is the bugs verification phase? What are the bugs I have to verify? All bugs fixed in the milestone's stream must be verified the week of the milestone delivery. To avoid a bug verifying by several committers at the same time, the whole bugs list is split into several ones. An email is sent to each verifier with the corresponding list of bugs to verify. When do I have to verify my bugs? Usually this verification starts as soon as you get your bugzilla request and a warm-up build is available on Eclipse Project Downloads page. How do I verify my bugs? add a formatted comment to the bug: "Verified for <current verified milestone> using <build name> build"
(Note that for build name is not necessary when resolution state is INVALID, NOT_ECLIPSE or WONTFIX). What if I my fix is not in the build used for the verification? If your bug fix is not in the build used for the verification (typically if you commit the fix during or after the verification day), you must coordinate with a verifier and tell him what build to expect the fix in. When can I consider the verification finished? When all your bugs are verified, wait for the email sent to all team members and to the jdt-core-dev@eclipse.org list. This mail describes the status of the verification and indicates which JDT/Core version is eligible for the milestone. You are also informed whether the corresponding stream is reopened for development or not. What should I do if I need to contribute after the verification was finished? What is the build test usage? How do I deliver a patch for a maintenance stream? Much in this list is outdated: we no longer maintain explicit build notes, we no longer use CVS etc. Increment the plugin version id by finding all text references to the previous version id in the org.eclipse.jdt.core project and replacing them with the incremented version id. Close the build notes using the JDT/Core tool (right click on the file, then JDT Core tools > Close build notes). Add 'Posted on JDT/Core update area' after the date. E.g. Commit the build notes and the files modified by the plugin version id increment. How do I get the JDT/Core tools? The JDT/Core tool can be obtained from this update site: http://www.eclipse.org/jdt/core/tools/jdtcoretools/update-site/ using Eclipse update manager. (1) "Small" contributions (patches) coming from non-committers. For this, we ask you to use the attachment flag "iplog+". Please remember to add this flag whenever you commit a patch from a non-committer. This page was last modified 16:06, 4 October 2018 by Stephan Herrmann. Based on work by Fabian Steeg, Markus Keller and Carmi Grushko and others.